With delightful memories of both the “old” days in St. Barths, and lots of experience in the here and now, Lidy specializes in St. Barths, Anguilla, and St. Martin and just returned from a trip to make sure everything was in order (and to enjoy the restaurants and get in a little sun while at it). We sat down with Lidy to talk about her recent trip to St. Barths, her favorite sounds and scents from the island, and…some of her best villa picks. WIMCO: You mentioned that arriving in St. Barths is always a pleasure, and that you loved being met by the wonderful team of concierges. Lidy: Yes! It is amazing how every time I land in St. Barth it excites me—it is like coming home. You would think that after all these years that it would become routine. On the contrary, it gets better every time—to see familiar faces right away is a great joy. WIMCO: On your day off, you showed Valerie [who heads up the Air Dept—ask her to arrange your flight on your next visit!] around the island. What were the “must-sees”? Lidy: The group concentrated on the beaches of course. I loved showing her Corossol and its couleur locale—the rugged area of Grand Fond with the old stone walls which make you feel like it’s hundreds of years ago. We continued to make a full circle of the island, showing the many different looks and feels, which is amazing for such a small island. Someone told me that in the old days, people living in Colombier would never make it over to Grand Fond! WIMCO: You recalled that during the tour, your remembered the first time you toured “and how magical it was”. When was that? Lidy: It was in 1991, when my colleague Suzanne H. took me under her wing during my first trip to the island and showed me everything. WIMCO: You then started an epic villa tour! One of your favorites from the first day was Villa WV BEA. You called it “the treat of the day”! Tell us more. Lidy: I have read many testimonials from our clients about the house, but it was a thrill to see it for the first time. The house is cozy because of its architecture: tiny bungalows painted in true Caribbean colors, intimate outdoor sitting areas, and intimate decor on the inside. The bedrooms have nooks and crannies and make you want to curl up in there with a book (at night of course, because during the day you just want to be outdoors and enjoy the garden and beach with the sound of the gentle surf). It’s the kind of place you can just be home, cook, relax and enjoy. WIMCO: Were there any other houses that you saw for the first time? Lidy: Yes, I saw Villa WV CLA [right on Flamands beach] for the first time, and what a treat it was. It’s a great little beach house, especially for one couple. It is a very friendly villa; the picket fence around it gives it a sense of privacy, and then opens up on to a “palm-y” area between the house and the beach, perfect for lounging in the shade. WIMCO: Villa WV RSD was another one of your favorites. It’s a gorgeous contemporary villa, filled with daybeds out by the infinity pool, modern interior design, and showers with huge windows to let the natural light in. The villa’s located in Vitet, which is past St. Jean and Lorient. Why types of clients might you seeing enjoying this house? Lidy: This is a house for a veteran of the island who wants to explore. I tend to concentrate on St. Jean, Gustavia or Lurin for clients on their first trip to St. Barths, and recommend they explore the whole island, while coming back to a central location. That way they get a feeling of where they would like to be when they return. WIMCO: "Villa WV GGL, what a gem!" (Your words!) What’s the first thing that hits you when you enter this house? Lidy: When you enter, the first thing you see is the gorgeous view and the inviting pool. The clients renting the house were kind enough to let us see it while they were there. They gave us the tour and I could sense their enthusiasm for the villa. They were there for two months and loving every minute of it. I love to have both Gouverneur Beach and Gustavia nearby…. and my favorite restaurant, Santa Fe, is seconds away. WIMCO: As you continued along your island tour, you remarked “As we were driving, we saw two Corossol ladies in their dresses and straw hats, walking down the road. Two sisters—no doubt. On our way back, they were bobbing in the water—dresses and straw hats on… one of the sweetest sights I have ever seen in St. Barths." It’s a lovely image, and for many, will be familiar. 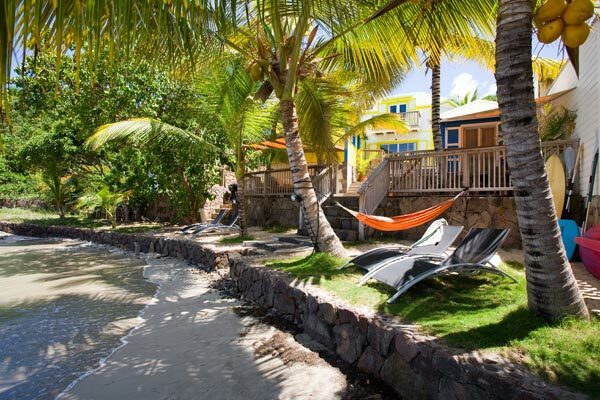 What other sights and sounds feel quintessentially St. Barths to you? WIMCO: You came back from the trip declaring it official: “WV ELA—I have decided it is my all time favorite.” They’ve just added a new building to the house, which you said blends in so well. Tell us more about what’s been redone, and why you love it so much. Lidy: They’ve added a building in the same architectural style as the main house, and when you enter the property, it looks like it has always been there. Yes…I have always loved this house: the setting, the decor, the sounds of Flamands Beach and the history of it all. 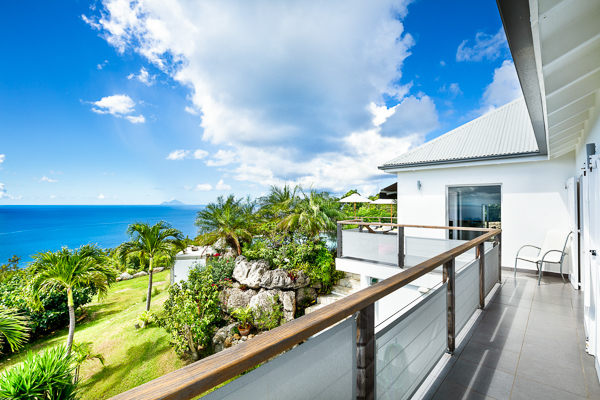 WIMCO: Tell us about Villa WV LLA, in the hills of St. Jean, with views in the opposite direction over to Saline. Lidy: Clients love staying here! The house is perfect in my opinion…very comfortable with two bedrooms on each side of the living room, and two bedrooms downstairs, side by side. The decor is very tasteful and accommodating, and the pool is great with wonderful views of St. Jean. The master bedroom has a bathroom with views on both sides, of Saline and St. Jean. The house has seating in the back looking towards Saline, and the owner is building a new observation deck in that area. I have a feeling that once completed, it will give you a 360-degree view. WIMCO: You mentioned how much fun you had with “the boys” in the WIMCOsbh office, with villa tours and rides from David and the rest of the team. Lidy: We are blessed with a group of wonderful concierges. On the plane to our next stop, Anguilla, I was thinking about my time in St. Barth—it’s always so joyful, heat or no heat. I just love the island and am very proud of what has been established with our new office. I love to hear clients say that it is a well-oiled, friendly machine. Have questions for Lidy or want to know more about her trip and favorite villa picks? Contact her here! LSchalekamp@wimco.com or call her at 401-236-9006.